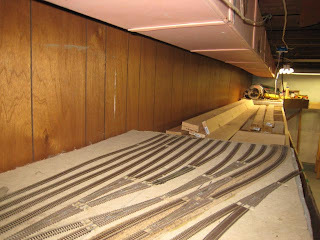 Chris has sent more pictures of his new soon to be N Scale empire, enjoy! 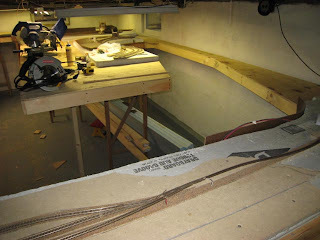 This is from the staircase looking down onto the layout. Looks like Chris has a curious visitor! He sees something that probably would taste good! Comments can be posted by anyone at the bottom of the posting, please use this feature.....I have to ask what's the cat's name? 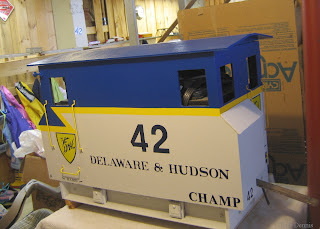 Brad Peterson's has finished his 7 1/4" Box Cab, looks nice in blue and grey!! 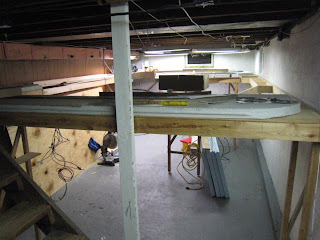 Well, I've been plugging away down stairs finally. Have reassembled the existing portions of my old layout and with the addition of six new sections in a new configuration(as of today 5 out of six have been built). 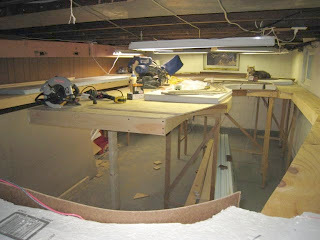 I painted the walls and floor, also installed two new circuits - one for lighting and another for layout and tool power. Hope to have trains running by next week. It is N scale and I'm still deciding on what Route, but I'm leaning toward the Riverline over the Mohawk. 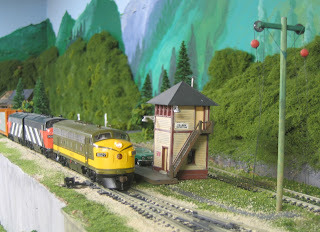 Thought you just might enjoy a photo of one of the model train projects I'm currently working on. The locomotive is G-scale, an actual steamer fueled by butane. The wood construction of the cab is a test shot from a manufacturer I'm working with (Ozark Models), and is laser cut from aircraft plywood. 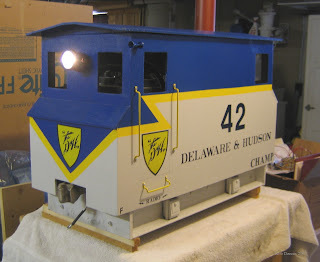 The model is getting modified to closely resemble a Maine narrow gauge engine, Wiscasset, Waterville and Farmington #3. 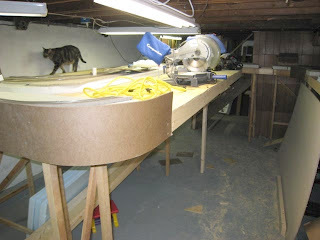 The little furry QA Inspector (Squeeky) frequently 'helps out' on the workbench as you can see in the photo. This was a few days ago, and the cab has now been completely assembled, stained and poly-ed, and tomorrow, with lousy weather predicted, I'll be adding some details to the side door areas and the roof. Squeeky arrived here in mid-December, one of my best Christmas presents ever. Not a bad deal for her, either, as the alternative may have been euthenasia - she was the four-year old pet of a friend at the hobby shop who passed away suddenly at the age of 56. Alex was a serious modeler, retired on disability, and spent a lot of hours at the bench in his Cohoes basement apartment. Squeeky thus knows her way around model work, tools, and, I have to admit, if she was learning from Alex, knows quality work as well...An excellent inspector, although she doesn't show me the reports ! There's another photo here, shows her after a tough day in the shop. Yes, she WANTS to be covered up like that, actually prefers to be COMPLETELY under the covers ! Seems like Spring is having a hard time arriving in upstate New York. But warmer is around the corner and our Thursday night meets will be coming to an end soon until next fall. 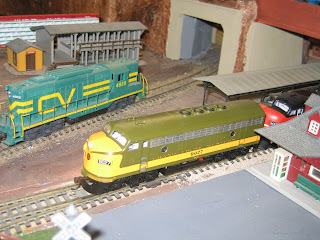 So we revisit an old friend, Bill Hickey and his Central Vermont Railroad. 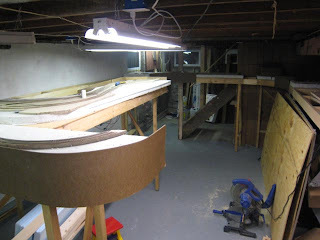 On Thursday, April 12th the lights are back on in the basement at Bill's and the railroad which has been quiet for the winter shows it still has life left and work to be done. We had a very good turn out for the night, some young, some familiar and some only a mother could love! Bill spent the day cleaning the track and I'm happy to say everything ran well. 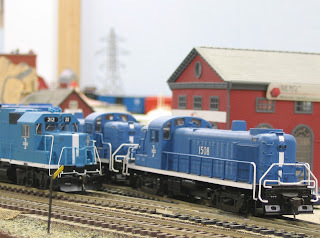 Bill showed off his new Athearn Genesis units, be sure to check out Bill's layout in the video section. A few projects need to be finished around the layout, scenery around the engine house, waterfall needs to be completed and a permanent bridge installed and finally the paper mill on the mountain division. 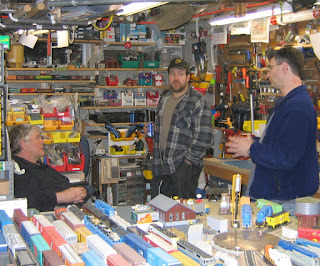 Hopefully our visit will help inspire Bill to keep the trains running for years to come! 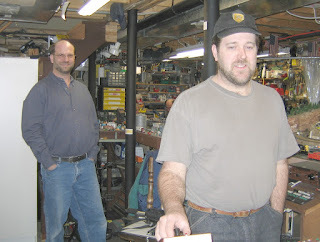 This past Thursday, March 29th, we got together with Randy Epstein. 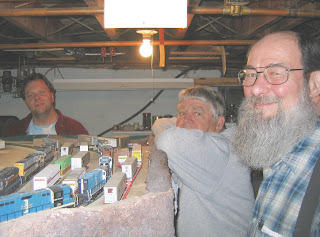 For most of the guys it was the first they had seen his layout since he is our newest member of the group. 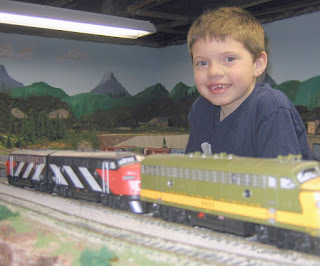 Randy really likes motive power, all makes and models and he has a lot of it. It was nice to see a B&M freight wait for D&H freight pass at a diamond, it reminded me of something I had seen many years ago in Mechanicville. 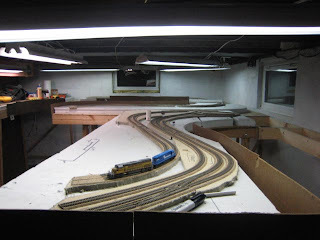 While Randy's layout is no where near finished, it does have a finished look to it. 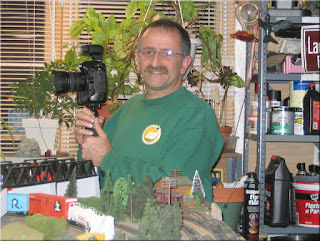 He has buildings, tons of vehicles and figures all over the layout. 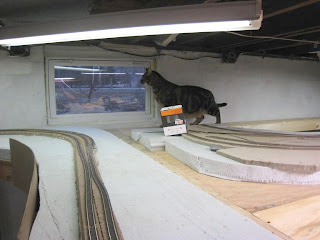 He started some scenery, and ballasted a few feet of track, I'm still impressed with the overall appearance. His wiring is very neat and complex, he has a really nice control panel that would take some time to learn. 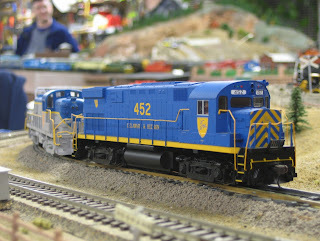 His layout is not DCC, it's all block and cab control, still pretty slick to watch him run it. So we all had a good night and Tony Bucca treated us to trackmaps of the D&H from the 30's. Hope to see Randy's layout again soon.